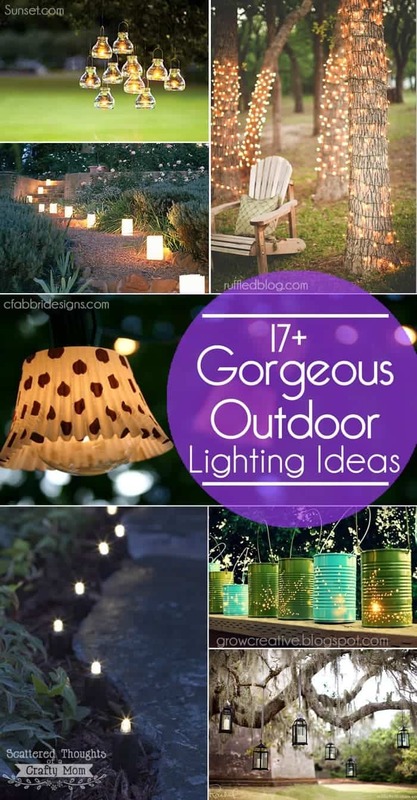 Hey Guys, I’m sharing these gorgeous and easy to duplicate outdoor lighting ideas with you today, Enjoy! I think I’ve mentioned before, my mothers day gift this year was yard work. I definitely got my “money’s worth” out of that gift. It took my hubby a couple of weekends to finish the makeover on our little side garden. I pitched in a little when we were shoveling and spreading the rock and choosing plants, but that is about all I did. 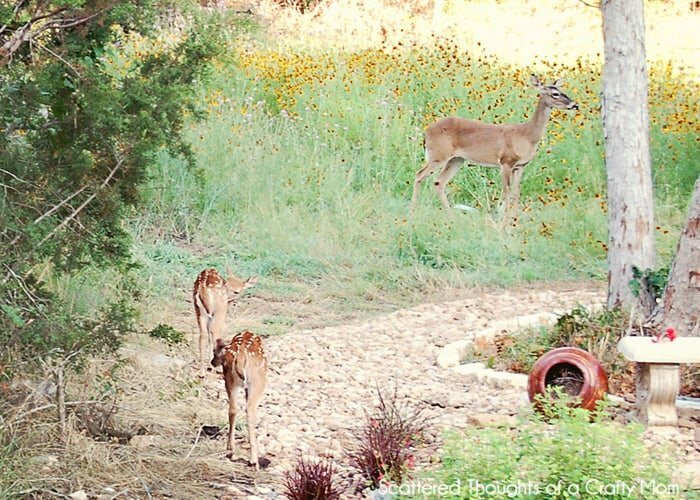 It was really hard to get a good picture of the garden, I may have to go to the upstairs deck to get a full picture. 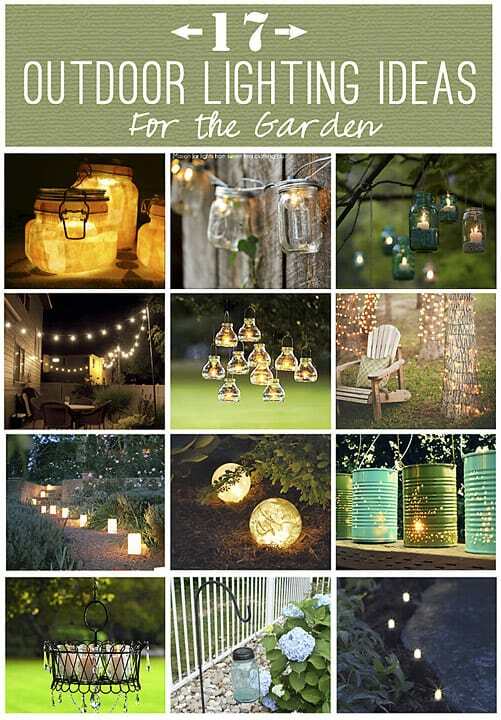 I have spent some time lately browsing and collecting Outdoor Lighting Ideas on Pinterest, Houzz, and Google Images to get inspiration for the hubby’s next project I have come across a few images and project ideas that are just perfect for our garden and an excited to share them with you! 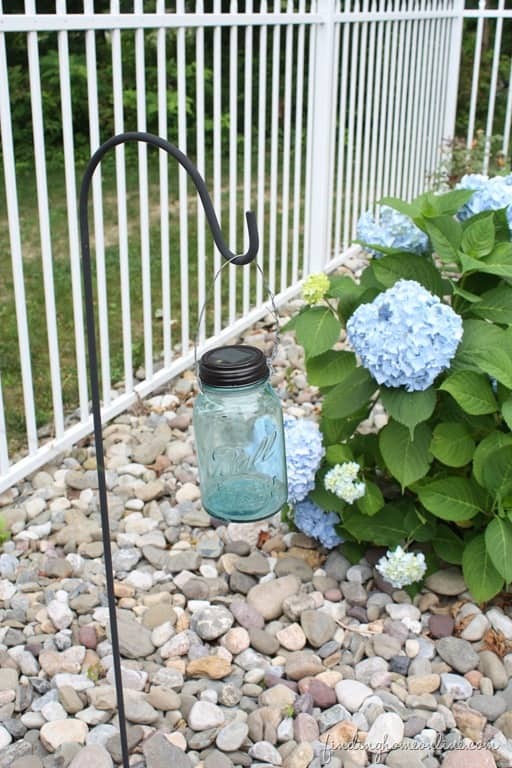 I love these little mason jars hanging from mini-shepherd’s hook. 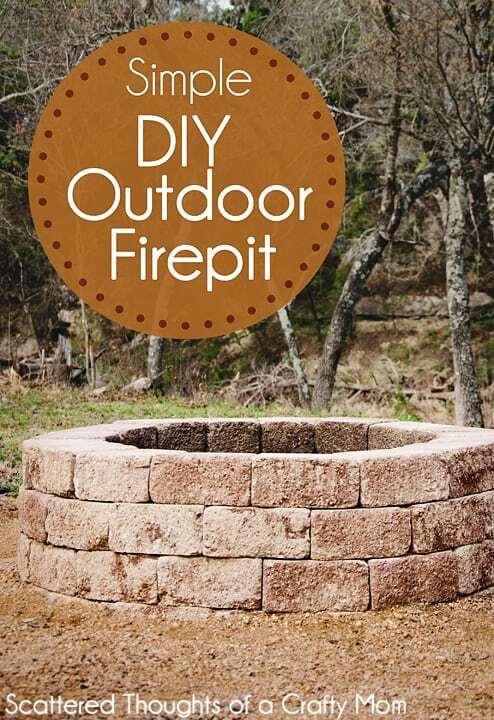 You can get the tutorial and make some for yourself at Finding Home. 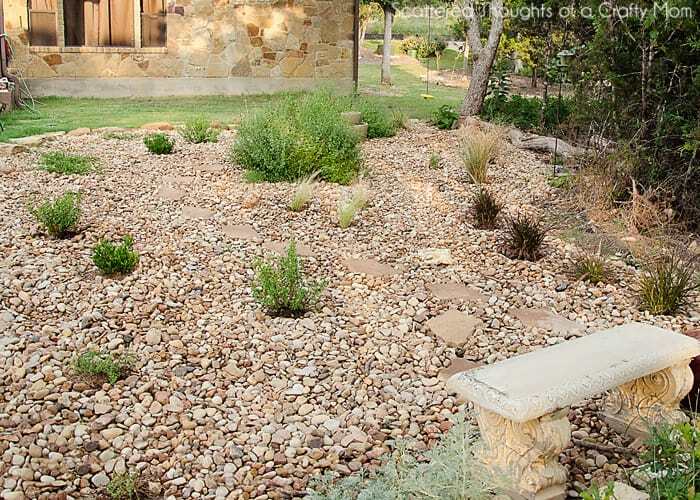 I can totally picture something like this in a couple of spots around the perimeter and by the stone bench. 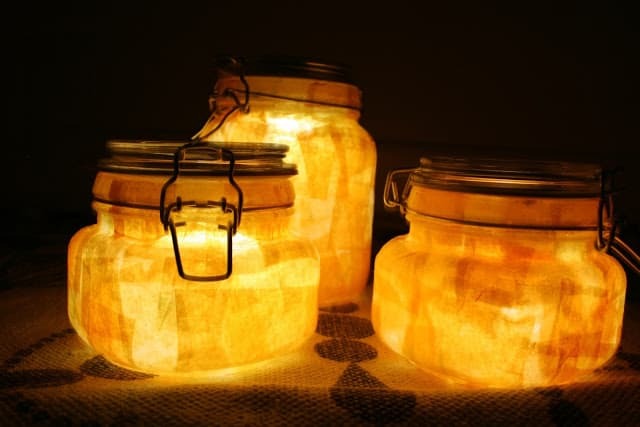 Of course, if you are not a DIY-er or just don’t want to make your own, you could always buy premade mason jar lights like these gorgeous ones from Sweet Tea Clothing Co. on Etsy. 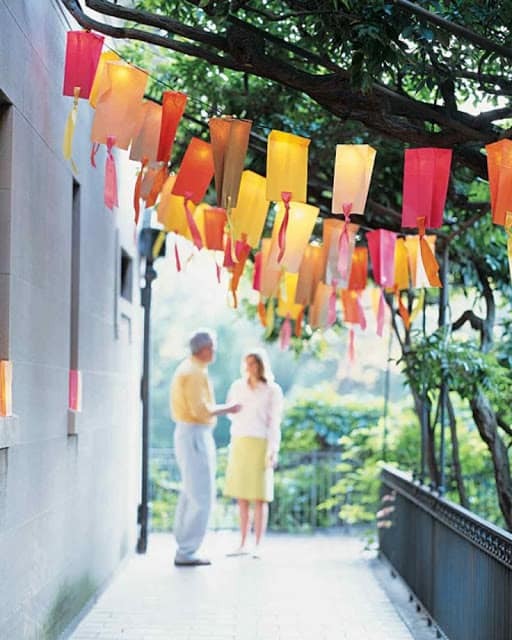 If you have a lot of trees in your garden, you can find a ton of hanging lantern ideas. 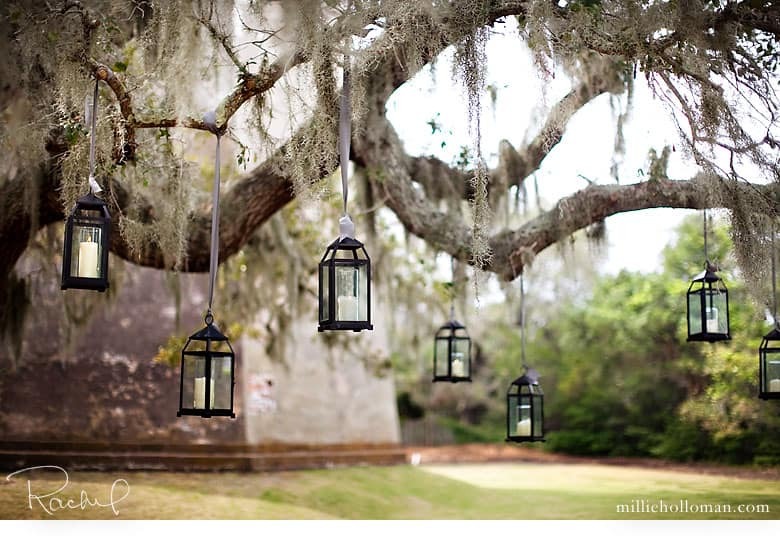 Like this one from Millie Holloman’s Photography blog. 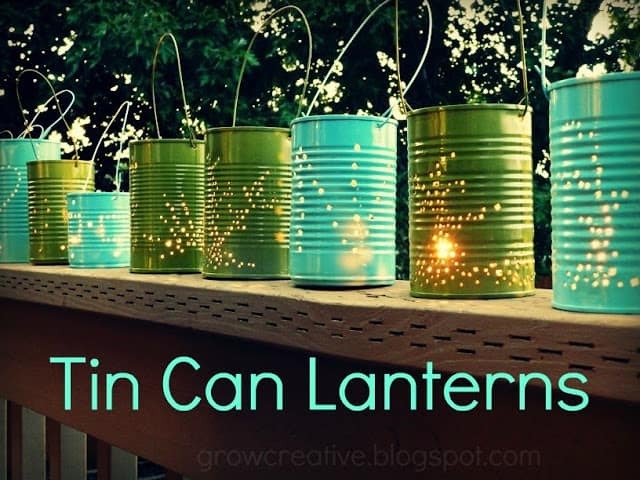 I think I have seen very similar lanterns at Hobby Lobby. 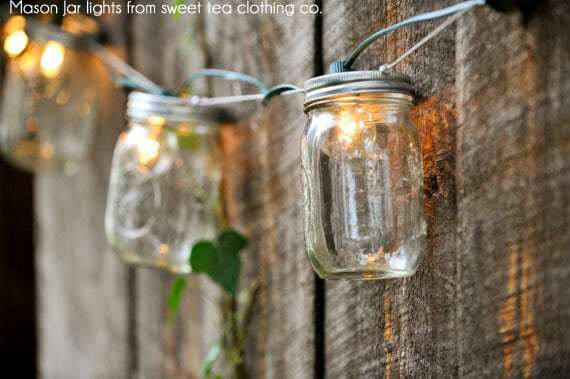 Another hanging mason jar idea, though I can’t find the original source for this photo. 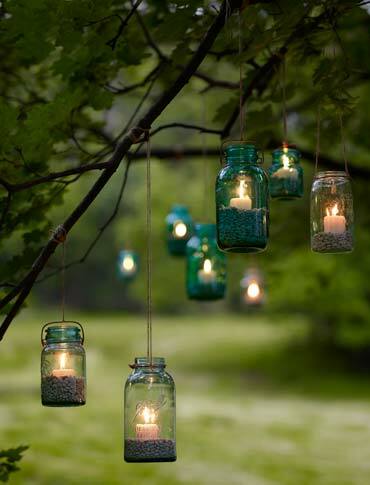 These little suspended votives are just gorgeous. 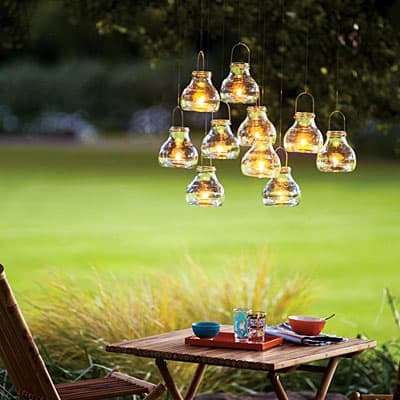 These little sun jars from Fox and Feather would be perfect soft lighting on my outdoor coffee table. 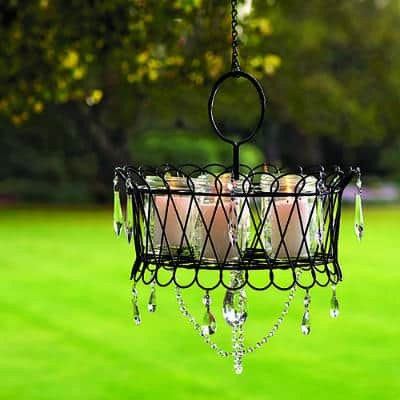 This is a great idea for a DIY chandelier. 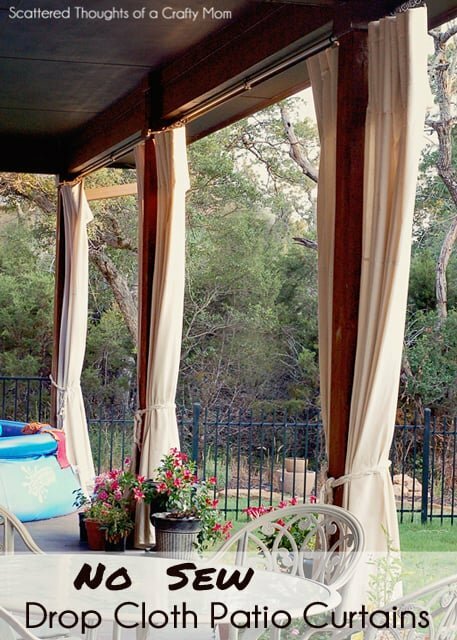 Something like this would be perfect over our door dining set. 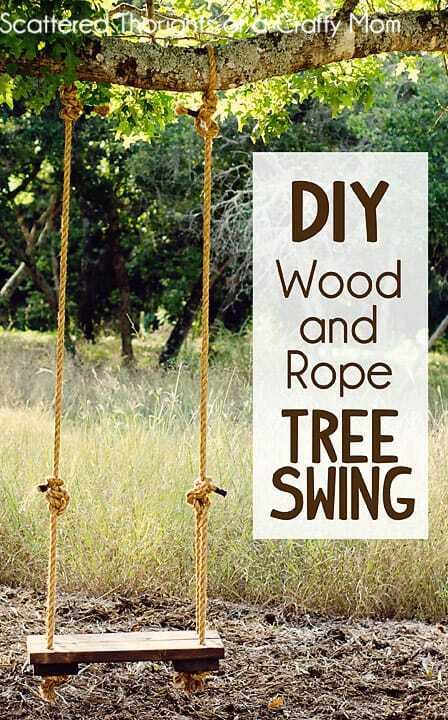 We have a ton of trees, it would be so gorgeous to wrap a few of them in white rope lights and create a little sitting area. 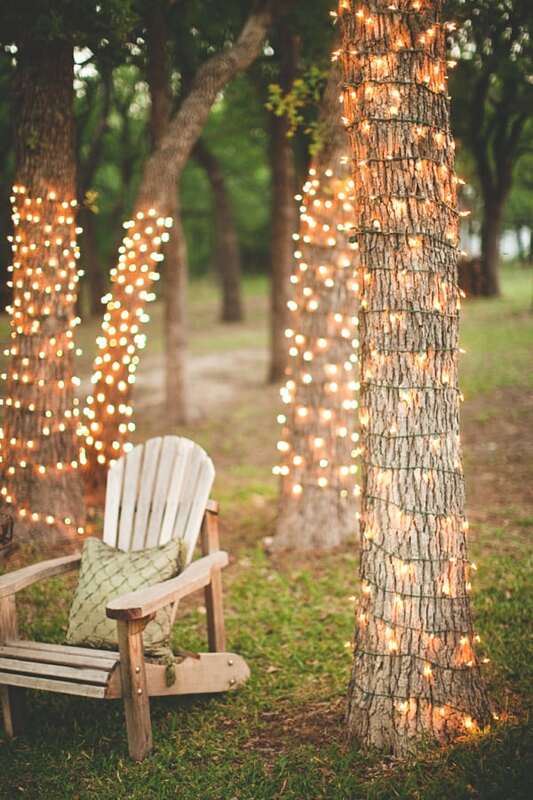 How pretty would a lighted trellis be over our stone bench. 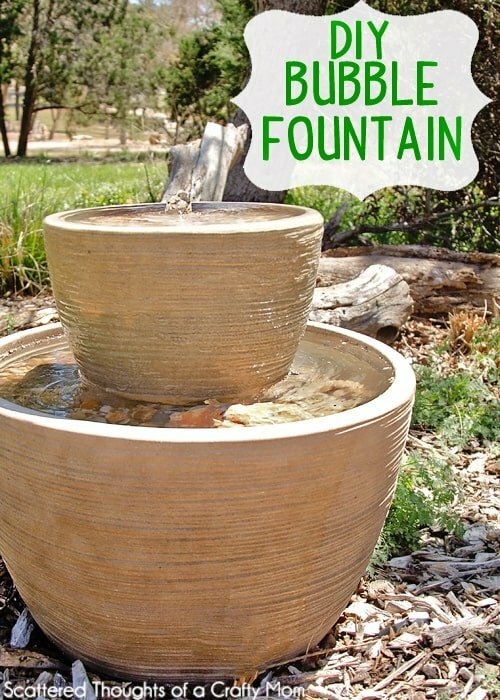 See how to make this one over at Kojo Designs. 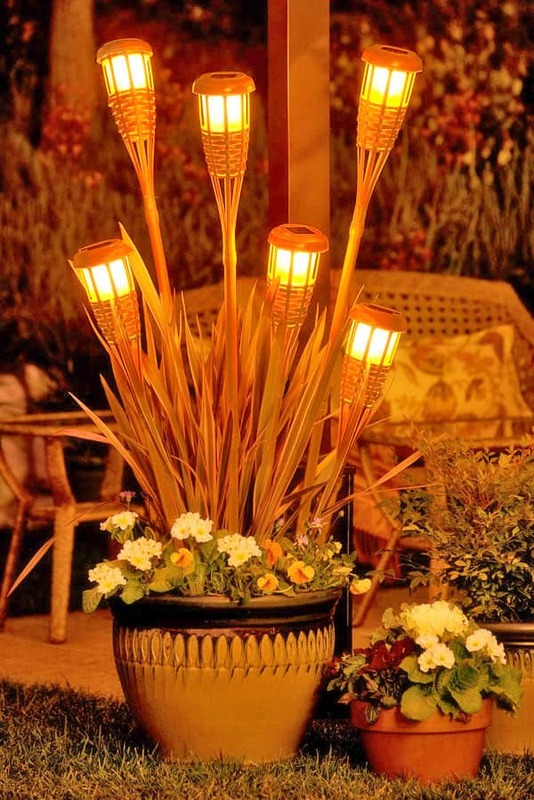 This Tiki Torch Display is so awesome and so doable! 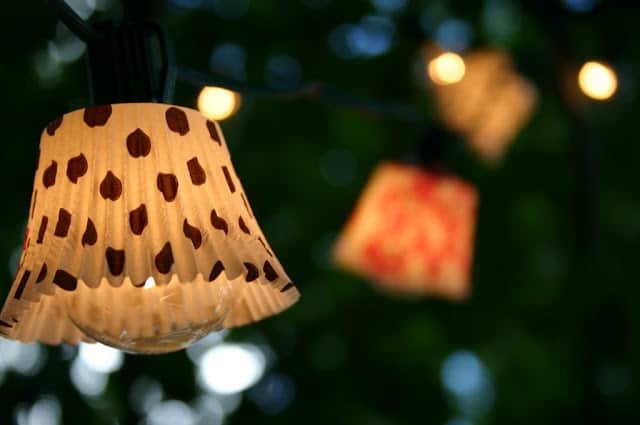 These cupcake liner lights are so darling and creative! 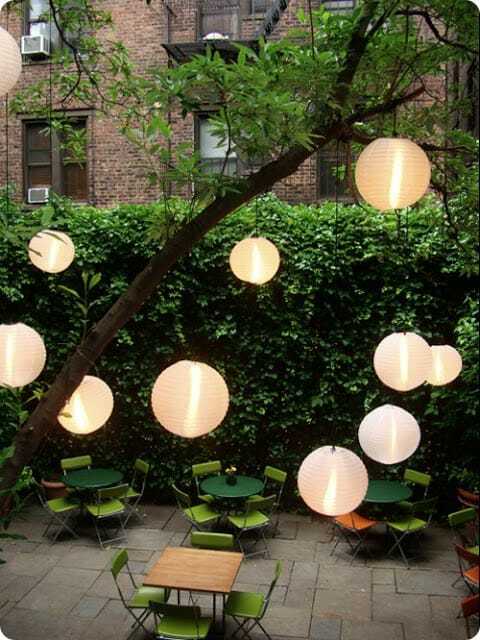 Or it could be something as simple as Japanese lanterns with battery powered luminaires hung from the trees! 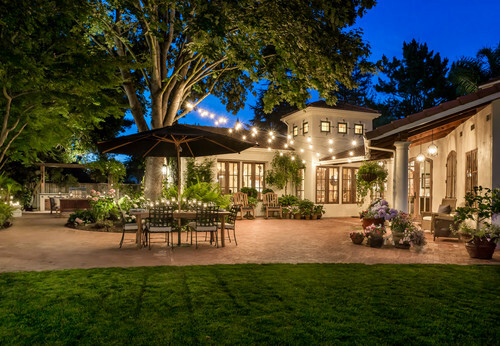 We definitely want to hang some of the round bulb string lights over the top of the garden. Similar to the photos below. 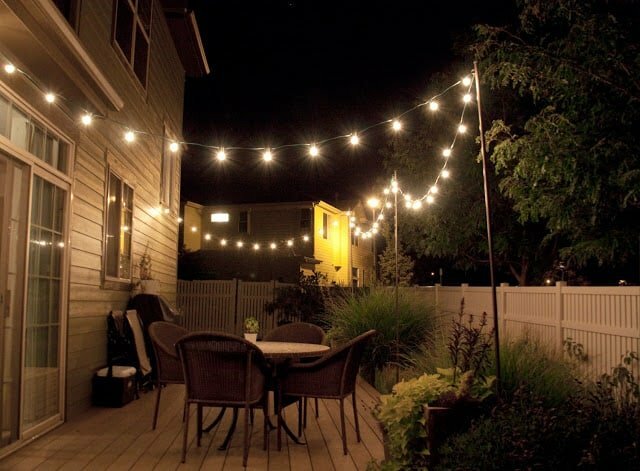 Finally found the perfect string lights here on Amazon! 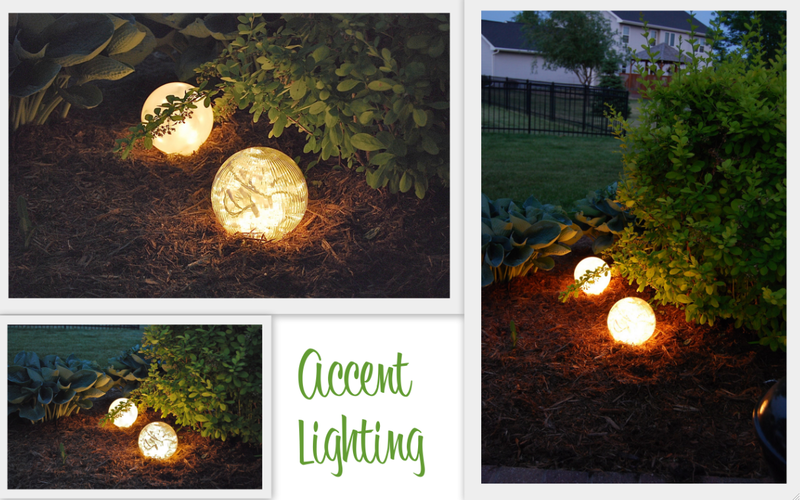 *UPDATE* I finally added some of these lights around our fire pit. You can see them here. 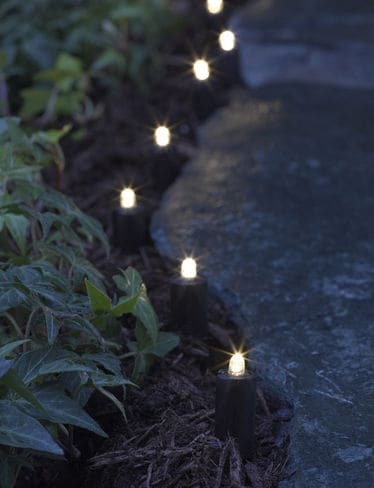 I love these pathway lights! 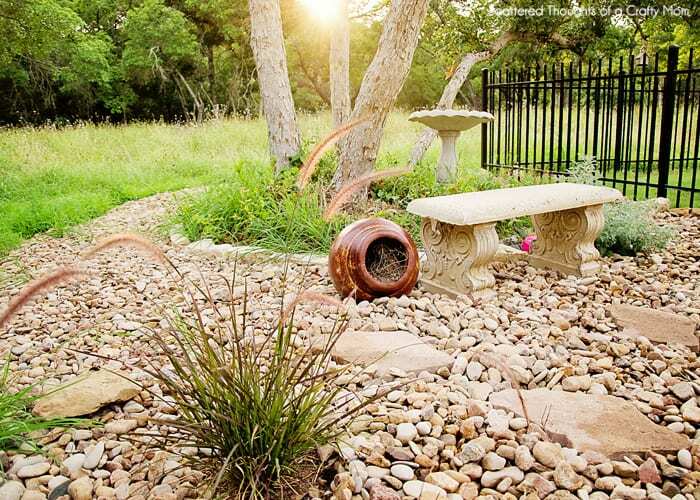 They are the perfect size for our rock stepping stones. 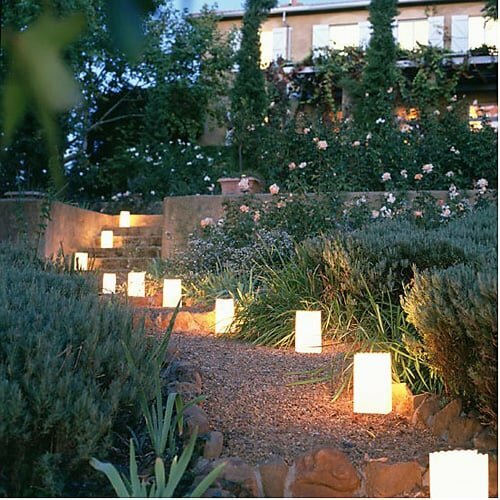 Of course if you have a wider pathway, you could go with a larger path light. 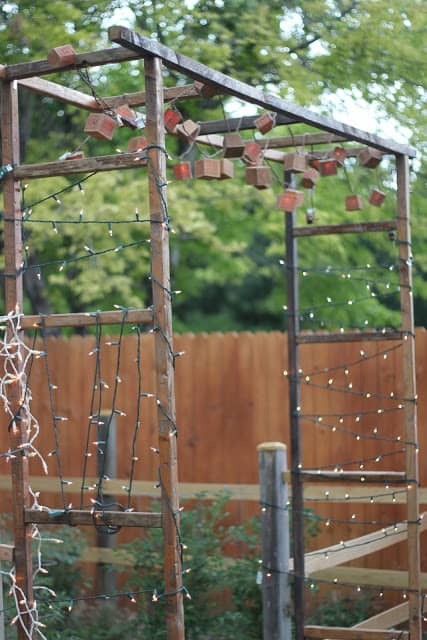 How cool is this DIY String Light Design found over at A Beautiful Mess? 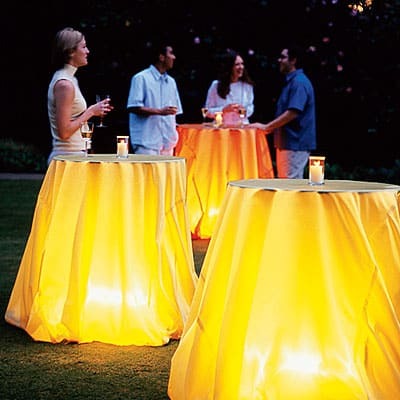 I don’t have a place for these now, but I love the look of these lighted tables for a party. How about you? 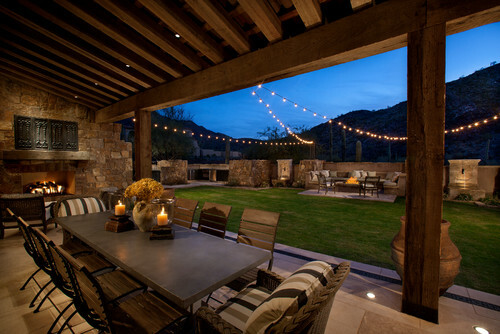 Do you have any big plans in the works to spruce up your outdoor space? 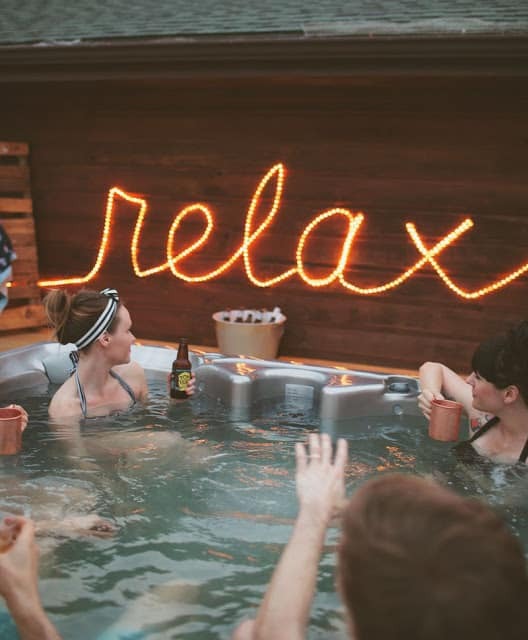 I’d love to hear from you about your plans!